Tocumen International Airport (Spanish: Aeropuerto Internacional de Tocumen) (IATA: PTY, ICAO: MPTO) is the international airport of Panama City, the capital of Panama. The airport serves as the homebase for Copa Airlines and is a regional hub to and from The Caribbean, South, North and Central America and additionally features routes to some European and Asian cities. There is high terrain to the north of the airport. The Tocumen VOR-DME (Ident: TUM) and non-directional beacon (Ident: AT) are located just south of the field. During World War II, Panamanian airports were leased exclusively by the U.S. military. The nearest airport to Tocumen was the Paitilla Point Airfield. Several airports were built to protect the Panama Canal from foreign aggression. The 37th Pursuit Group at Albrook Field replaced the P-40 Warhawks of the 28th Pursuit Squadron at the Paitilla Point airbase from 9 December 1941 though 26 March 1942 in the immediate aftermath of the Pearl Harbor attack. Tocumen International Airport was inaugurated on June 1, 1947 by President Enrique A. Jiménez, and airport operations began before the construction works were completed. The administrative building/passenger terminal was inaugurated seven years later, during the administration of Colonel Jose Antonio Remon Cantera. The old airport building, which currently is being used as a cargo terminal, was built on an area of 720 ha (1,800 acres) and was 126 ft (38 m) above sea level. As time passed, and due to Panama's role as a country of transit, that terminal became too small to attend to the growing demand for air operations. These circumstances compelled the aeronautical authorities at the time to consider expanding the airport. Work on the new buildings began in 1971. In order to build the structure that currently houses the current passenger terminal, a lot of land had to be moved and the bed of the Tocumen river had to be diverted from its original site. The current passenger terminal was inaugurated on August 15, 1978 and operations began on September 5 of the same year. The Tocumen International Airport is one of the few airports in the region that has two landing runways able to serve the largest commercial aircraft operating today. The name of the airport was changed in 1981 by the military government for Omar Torrijos International Airport, in honor to the Panamanian leader who died on July 31, 1981, at the age of 52 in a plane crash in Cerro Marta, Coclesito in very bad conditions. After nine years, the original name was reestablished after the fall of the dictatorship of Panama by the U.S. invasion of 1989. The original runway (03L/21R) is mainly used for cargo and private flights, but also as a supplement to the primary runway during peak traffic periods. The main runway (03R/21L) is 3,050 m × 45 m (10,007 ft × 148 ft) and is used primarily for commercial flights, the 03R direction is ILS Cat. I enabled. 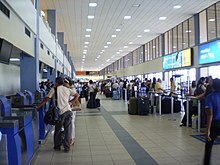 Until May 31, 2003 Tocumen International Airport was managed by the Civil Aeronautics Directorate (which is known today as the Civil Aeronautics Authority). On June 1 of that year, an innovative terminal management platform was created through Law No. 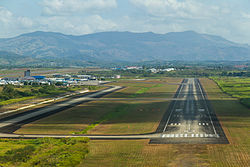 23 of January 29, 2003, which set out a regulatory framework for the management of airports and landing strips in Panama. This law allowed the creation of Aeropuerto Internacional de Tocumen, S.A., also referred to as Tocumen, S.A., which currently manages the terminal. This law is one of a number of laws that restructured the aeronautical sector in Panama to further its improvement and modernization. In August 2015, it was announced that Emirates would operate flights to Tocumen International Airport from Dubai starting February 2016, at which point it would have become the world's longest non-stop flight. In January 2016, the route was delayed due to a lack of economical opportunities for the flight. It has not yet been announced when the flight will begin regularly scheduled operations. It was planned to make the route between Tocumen International Airport and Dubai the longest flight in the world, until Emirates started flying between Dubai and Auckland. During 2018, Tocumen International Airport will undergo the completion of the airport's new South Terminal. In 2006, Tocumen S.A. started a major expansion and renovation program. The main passenger terminal was expanded 20,830 m2 (224,200 sq ft) at a cost of approximately US$21 million. New boarding gates were built to allow more flights to and from Panama, and to facilitate the growth of commercial and internal circulation areas. Tocumen airport administration acquired 22 new boarding bridges and replaced the oldest 14. This included the addition of 6 remote positions, hence allowing Tocumen Airport to have a total of 28 boarding gates. The new installations were opened in 2006. The airport also has a VIP lounge, Copa Club, operated by the partnership between United Airlines and Copa Airlines that caters to Copa's partner airlines and Star Alliance members. It also had an Admirals Club for American Airlines, which closed on June 30, 2012. The Lounge Panama, a VIP airport lounge operated by Global Lounge Network started operations at PTY on January 9, 2019. The next step of the modernization project was the purchasing of new equipment to provide service and support to the common areas of the airport. New equipment included: modern boarding gates and elevators, luggage conveyor belts, flight information system, and revamping the air conditioning system. The renovation of the old Tocumen international airport (originally built in 1947) to be used solely as a cargo terminal, was the last step of the modernization project of Tocumen international airport. It included the redesign of the central building, the construction of new buildings for cargo companies among other improvements. The second expansion phase of Tocumen International airport is the Northern Terminal. At a cost of USD 60 million, a completely new terminal with 12 additional terminal gates was built. With these 12 new gates plus the existing 22 gates and the six remote aircraft docks, there will be a total of 40 gates. The new facilities include platforms, taxiways and a new road which connect both the cargo terminal and the airport's administration building. The Muelle Norte is linked to the main passenger terminal and have 10 moving walkways for passengers and 1,400 m2 (15,000 sq ft) commercial areas. The luggage sorting system was expanded to accommodate increased demand. The tender for the design of the second phase was given to Ecuador-based Planman Cia Ltda. Colombia-based Aerotocumen won the tender of the construction of the North Terminal. The South Terminal started a bidding process during the first half of 2012 and the contract was acquired by the Brazilian company Odebrecht. Tocumen S.A. made an investment of US$780 million, which includes 20 additional gates. It includes the construction of a new terminal, hundreds of parking spots, Tocumen river diversion, and four new direct-access lanes to the airport. The new terminal is scheduled to be completed in 2018 in order to begin operations in early to mid 2019. ^ Airport information for MPTO at World Aero Data. Data current as of October 2006.Source: DAFIF. ^ Airport information for Tocumen International Airport at Search (for) Travel website. ^ Airport information for Tocumen International Airport at Great Circle Mapper. ^ "Tocumen VOR". Our Airports. Retrieved 7 December 2018. ^ "Tocumen NDB". Our Airports. Retrieved 7 December 2018. ^ "Tocumen Airport". Google Maps. Google. Retrieved 7 December 2018. ^ "History of Tocumen Airport". Tocumen Airport Panama. 2010-08-01. Retrieved 2010-08-01. ^ Thompson, Chuck (2015-08-14). "World's longest nonstop flight announced". CNN. Retrieved 2015-08-14. ^ "Flights to Panama City". Emirates. 2016-01-12. Retrieved 2016-01-12. ^ "General Information of Tocumen Airport". Tocumen Airport Panama. 2015-05-12. Retrieved 2015-05-12. ^ "Admirals Club Lounge | Airline Clubs And Lounges | American Airlines". American Airlines. 2015-04-25. Retrieved 2015-04-25. ^ "PTY4-The-Lounge-Panama-by-Global-Lounge-Network". Prioritypass.com. Retrieved 23 January 2019. ^ "Global Lounge Network". Globalloungenetwork.com. Retrieved 23 January 2019. ^ "Expansion Plan of Tocumen Airport". Tocumen Airport Panama. 2010-08-01. Retrieved 2010-08-01. ^ "Copa Airlines expands its fleet and adds destinations in 2018". Copaair.com. Retrieved 23 January 2019. ^ Ltd. 2019, UBM (UK). "Copa Airlines launches Salta service from Dec 2018". Routesonline.com. Retrieved 23 January 2019. ^ "Tocumen Airport Report 2011 Website" (PDF). Archived from the original (PDF) on 2012-05-11. Retrieved 2012-03-01. ^ "INICIO". Tocumenpanama.aero. Retrieved 23 January 2019. ^ "Memoria Anual 2015" (PDF). Archived from the original (PDF) on 2016-11-05. Retrieved 2016-11-05. ^ "Annual Report 2017" (PDF). Tocumenpanama.aero. Retrieved 23 January 2019. ^ "Estadísticas Aeropuerto Internacional de Tocumen Enero a Diciembre 2018" (PDF). Tocumenpanama.aero.